JNN 03 July 2014 Yangoon : A fresh attack by extremist Buddhists on Muslims has left two people dead in the Myanmar’s second largest city of Mandalay , Myanmar police have imposed an overnight curfew, on Thursday, a security official says. “We do not want the situation getting worse,” senior Mandalay police officer Zaw Min Oo said, explaining that the 9:00pm to 5:00am restrictions were for security reasons. It said about 450 Buddhist rioters with sticks and knives took to the streets, despite an increased security presence. One resident told Reuters news agency Muslims were staying inside, for fear of attacks on their homes and businesses. “Most Muslims are hiding and some shifted to other towns near Mandalay and to hotels,” the resident said, who asked to remain anonymous. Aung Kyaw Oo, an army colonel in charge of security in the Mandalay region, told reporters that a Buddhist and a Muslim were killed and 14 people injured as Buddhist monks attacked a Muslim teashop on a second night of unrest in the city on Wednesday. There were reports of a heavy police presence on the ground, streets blocked with barbed wire and metal, and Muslim shops were closed. Police said four people were arrested during the clashes on Wednesday. Five people were also injured during the first night of the violence, which erupted between the two sides on Tuesday. Violence by extremist Buddhists against Rohingya Muslims has killed hundreds of them and forced many more to flee the country. 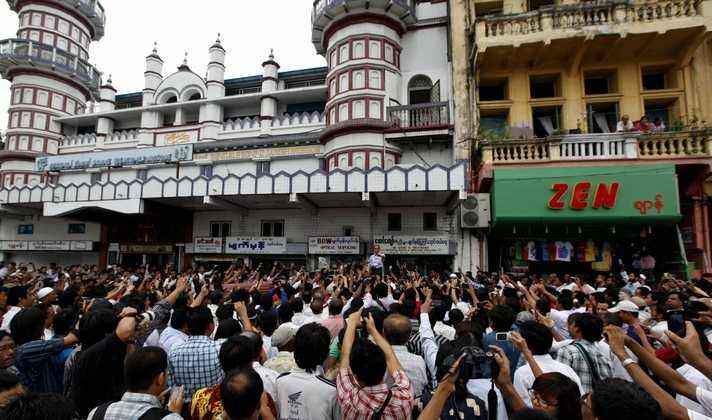 Unrest between Muslims and Buddhists has caused at least 240 deaths since June 2012. Most victims were members of Myanmar’s Muslim minority, estimated to be about 5 per cent of the population. Violent outbreaks have become more common under the reformist government, which lifted restrictions on freedom of speech including Internet access, which had previously been tightly controlled by the military. Rohingya Muslims in Myanmar account for about five percent of the country’s population of nearly 60 million. They have been persecuted and faced torture, neglect, and repression since the country’s independence in 1948. The UN recognizes the Rohingya Muslims living in Myanmar’s Rakhine State as one of the world’s most persecuted communities. The Myanmar government has been repeatedly criticized by human rights groups for failing to protect the Rohingya Muslims. International bodies and human rights organizations accuse the government of turning a blind eye to the violence. This entry was posted in Asia Pacific and tagged buddhist monks, Burma, Extremist Buddhist, Mandalay, yangoon. Bookmark the permalink.